Item # 315830 Stash Points: 2,495 (?) This is the number of points you get in The Zumiez Stash for purchasing this item. Stash points are redeemable for exclusive rewards only available to Zumiez Stash members. To redeem your points check out the rewards catalog on thestash.zumiez.com. You'll get there eventually, but at least your fashion is with the times in the Slushcult Slow Shirley Black T-Shirt. This t-shirt comes in an all-black construction with pink and green logo script screen-printed at the left chest and matching colored script at the back accompanied by images of a woman, a beverage, dice and a rose for an original look. 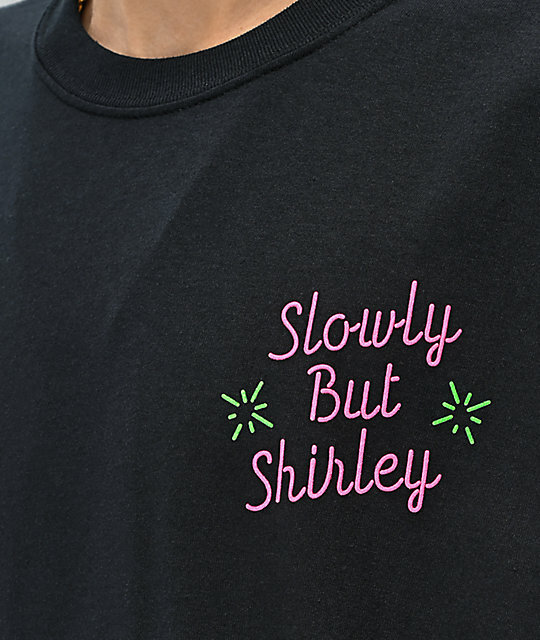 Slow Shirley Black T-Shirt from Slushcult. Pink and green script at the left chest and large matching colored images of a rose, woman, dice and a drink at the back.